Little Suhaila wishes she could have known her grandma, who would wrap her arms around the whole world if she could, Mama says. 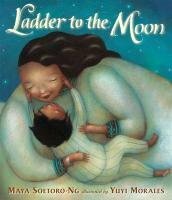 And one night, Suhaila gets her wish when a golden ladder appears at her window, and Grandma Annie invites the girl to come along with her on a magical journey. In a rich and deeply personal narrative, Maya Soetoro-Ng draws inspiration from her mother's love for family, her empathy for others, and her ethic of service to imagine this remarkable meeting. Evoking fantasy and folklore, the story touches on events that have affected people across the world in our time and reaffirms our common humanity. Yuyi Morales's breathtaking artwork illuminates the dreamlike tale, reminding us that loved ones lost are always with us, and that sometimes we need only look at the moon and remember. About Maya Soetoro-Ng (Author) : Maya Soetoro-Ng is credited in . A published credit of Maya Soetoro-Ng is Mixed: Portraits of Multiracial Kids.